BEIRUT: Saad al-Hariri, who resigned as Lebanon’s prime minister this month while in Saudi Arabia, told President Michel Aoun in a phone call he would be in Lebanon on Wednesday for Independence Day celebrations, Aoun said on Twitter on Saturday. Hariri arrived in Paris on Saturday with his wife from Riyadh, where he has been since he announced his resignation on Nov. 4. He is due to meet French President Emmanuel Macron later on Saturday. 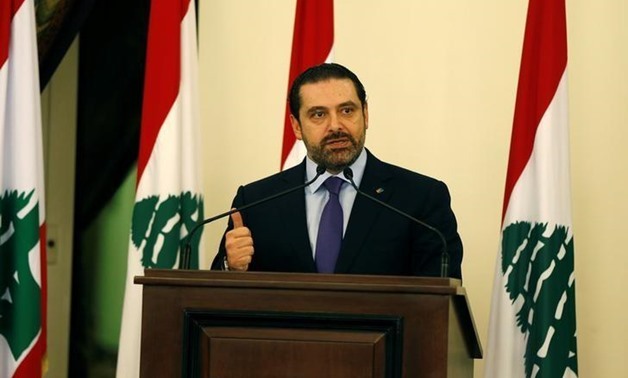 Hariri is in Paris at the invitation of France’s President Emmanuel Macron, who is attempting to help broker a solution to a political crisis that has raised fears over Lebanon´s fragile democracy. Hariri and his wife Lara, who landed at Le Bourget airport outside the French capital at 7:00 am (0600 GMT) after flying in from Riyadh overnight, were due to meet Macron at noon. A source close to the premier told AFP that Hariri’s two youngest children, Loulwa and Abdelaziz, born in 2001 and 2005 respectively, had stayed behind in Riyadh “for their school exams”. His elder son Houssam, born in 1999, was due to arrive in Paris separately from London. “Hariri does not want to mix his children up in this affair,” the source said. The couple were whisked to their Paris residence in a seven-car convoy under tight security. “To say that I am held up in Saudi Arabia and not allowed to leave the country is a lie,” Hariri had tweeted just before his departure, adding to repeated denials of the rumours from Saudi officials. Hariri, a dual Saudi citizen who has previously enjoyed Riyadh´s backing, announced his resignation on November 4.